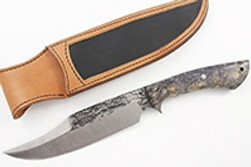 Lon Humphrey Custom Knives offer the buyer today to purchase a knife from a maker who is a rising star. Buyers know all too well that once a maker is famous prices skyrocket. Lon has teamed up with DLT to allow us to sell some of his nicest pieces direct to you at prices that are unbelievable! 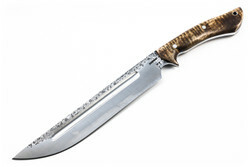 Take a look at Lon's videos; he forges his knives in his shop and produces works of art that allow form and function to combine with artistry. Lon Humphrey is a true American artisan - we stand behind his products 100%. 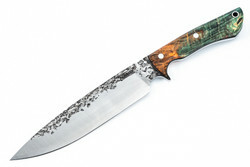 Shop our selection of Lon Humphrey custom knives for sale! 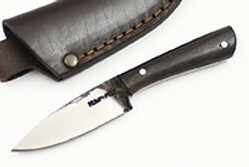 I just received my Lon Humphrey Vanguard in black canvas micarta today , It is a very nice knife and high quality . 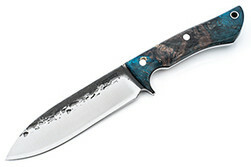 Lon Humphrey is one of my favorite knife makers and knives. Very well done craftsmanship nice handles and I really like the hammer marks on top of the blade they are unique and I love the look of the blade. 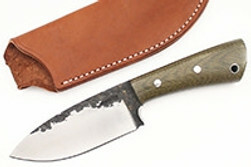 The Vanguard in my opinion is Lon Humphreys most beautiful knife , It looks great and feels great in the hand. I like the blade style too . A very nice knife with polished Micarta scale handles and a very nice leather sheath, though I wish the sheath had a removable dangler loop for low carry similar to my LT Wright GNS. I typically do not like high ride sheaths because the knife handle can poke at the waist when you are doing camp work or sitting with the knife in the sheath , however it should be fine. The other thing is this blade does not have a 90 degree spine , so if you want to use the fire rod use a fire rod with a striker like the Swiss Army or similar ferrocium rods. Those are only my two things about the knife and sheath that I noticed. 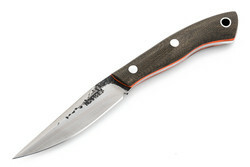 The Vanguard is a excellent outdoor knife for hiking , survival and hunting and camping multi use knife. 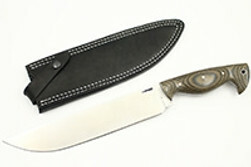 Just great , Thank you Mr. Humphrey for a beautiful crafted knife. Great experience with DLT Trading. The knives were presents for my children, as I am overseas, I didn’t see them personally but my kids loved them. I will be ordering one for my self soon. This is my first custom knife and it is a bit smaller than I expected but it sits in my hand extremely well. I bought the pocket sheath and the knife fits in there perfectly. The cocobolo scales are beautiful. The knife came extremely sharp and I am extremely happy with my purchase from DLT Trading. I can't wait for my next Lon Humphrey purchase!! 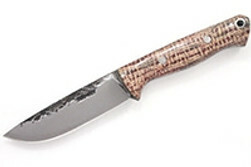 Beautiful little knife... Lon never disapoints! 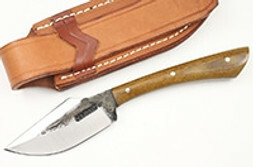 The knife & sheath are of the best quality! This is the second Muley I have purchased. This one is an early Christmas purchase for my son in law whom has drooled over mine since the day I got it. It is stunningly beautiful knife to say the least. I have cleaned 2 deer and several rabbits with mine this past season. While not quite as sharp as it was initially, it will still shave somewhat. I did not expect this performance from 1095 and the edge retention is a testament to Lon's heat treating. As always, DLT delivered in a very timely manner and they have never failed to respond to any questions I have immediately. Keep up the great job guys. This is Lon's best model to date imho. Terrific ergos with Lon's superior craftsmanship and build quality. A timeless classic. Lon truly knows what he's doing, no doubt. Aesthetically a superlative design, ergonomically the handles a bit thin for me allowing the knife to roll about in the hand. 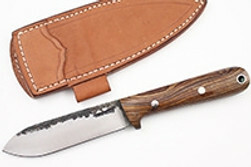 It's clear it's a hand made knife based on the fit and finish, not a complaint, just an observation. Although delivered sharp from the box the cutting edge is uneven side to side, although the blade grind is very good. 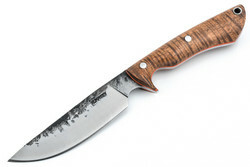 Sharper than Bark River Knives, not as sharp as any of my 4 Bradford fixed blades. The handle tarnishes very quickly, possibly something to do with my body chemistry. Sure wish Lon would work with some of the stainless steels or possibly CPM 3V as I could then fondle them with having to constantly chase the tarnishing issue. 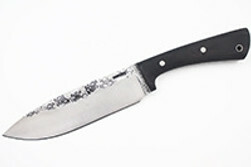 A beautiful knife with enough rough edges to give it personality!!! Continued success Lon. I originally order specific knife which was already sold so DLT called me personally and asked me which other knife I would like. That kind of service is hard to find nowadays. I will be buying from here again in the future. I compared several pictures of the same model as there are slight variations in the blade shape between individual knives, and selected the one I liked best. When I received the knife in the post I was amazed how beautiful it was. Very comfortable in the hand. Doesn't feel heavy even with the thick and wide blade. 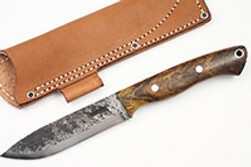 And I think the curly maple scales perfectly match the rustic look of the knife. Yes, my best knife so far! 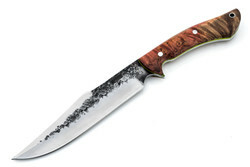 This is a great knife at a fair price. This is the second one I bought from you because I liked the first one so much.